The Dependency Ratio: What Is It, Why Is It Increasing, and What Are the Implications of the Increase? The dependency ratio,which is the ratio of the number of persons aged under 18 or over 64 to the number aged between 18 and 64,is projected to increase dramatically in almost all advanced economies and many developing countries over the coming 50 years. But should the increase in the dependency ratio also be a matter for concern? Will we become impoverished because the output of each worker has to be shared with a growing number of dependants? Copyright 2005 International Longevity Center-USA, Ltd. All rights reserved. 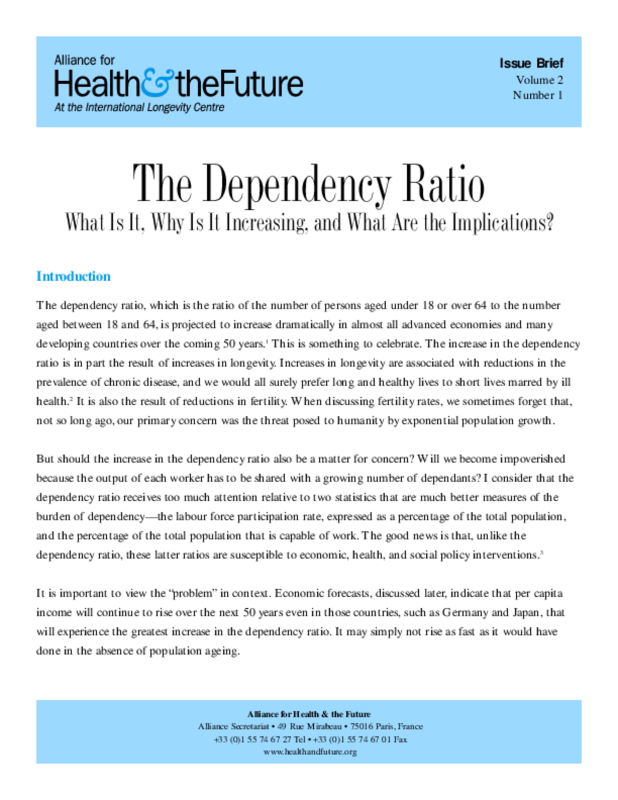 Title: The Dependency Ratio: What Is It, Why Is It Increasing, and What Are the Implications of the Increase?